An aggressive, stadium style vehicle that was born to kick up some dirt, the RADLINE RC DETOUR truly takes you off the "beaten path" for awesome, AWD racing! The READY-TO-RACE RADLINE RC DETOUR is one tough lookin competitor - on and off the track! Sporting a durable, custom engineered chassis, foam-filled performance tires and a real, wishbone suspension, the DETOUR Stadium Truck can take on the trails lesser RC vehicles fear to tread! 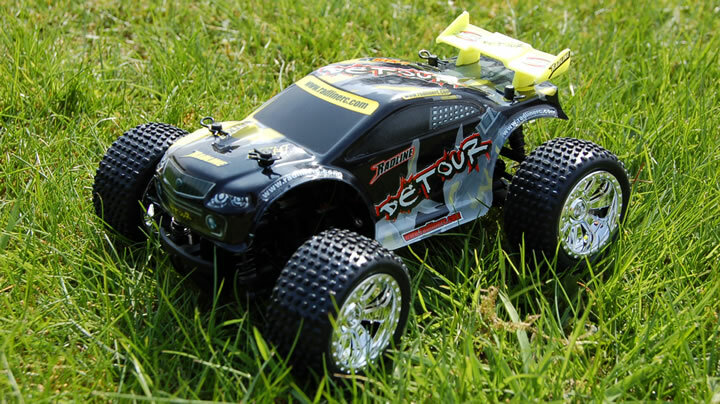 Your complete RADLINE RC DETOUR Race Kit also includes batteries, a racing spoiler, bumper, decal set and 2 channel TX controller. Still not enough excitement for you? "Modify and Maximize" your DETOUR with optional RADLINE RC performance parts and accessories! As the site is brand new we do not have any customer videos yet so upload of the month goes to us! Please share your videos and pictures with the rest of us. You can upload them by following the link below. The Radline forum is now online and fully functional. You can join the community now for free. Radline production is on schedule and the latest date we have for delivery is 10th August 2008.